Crucial has emailed HEXUS to alert us that its Ballistix Tactical Tracer RGB DDR4 Gaming Memory is now available. The new modules are available in 8GB and 16GB densities, in graded kits offering speeds up to 3000 MT/s and up to 64GB in capacity. Ballistix says that its memory modules feature 16 RGB LEDs per module in 8 zones. Another highlight is that users can 3D print their own light bar designs. 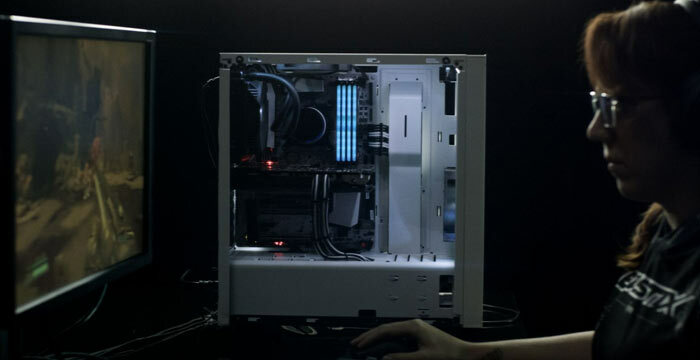 Above you can see the Ballistix Tactical Tracer RGB DDR4 Gaming Memory in action in a video. The user in the video, Smix, has deployed her own design 3D printed light bars for maximum visual impact. If you aren’t interested in 3D printing or such a deep level of customisation, in the box you will find a standard diffused look light bar cover, or you can deploy this RAM without covers for maximum brightness. Ballistix supplies these memory modules with the exclusive Ballistix M.O.D. Utility software. This can be used for monitor memory temperatures in real time, adjust Tactical Tracer RGB LED colour schemes and brightness, turn the lights on and off, and switch up display patterns. If you already favour another RGB lighting system, that is no problem as these modules will be compatible with Asus Aura, MSI Mystic Light, Gigabyte Aorus Graphics Engine, and other popular LED-controlling software via upcoming software update. If you are interested in Ballistix Tactical Tracer RGB DDR4 Gaming Memory you can get it directly from crucial.com or via select global partners. Buyers receive a product backed by a limited lifetime warranty. Here in the UK, a single 8GB DDR4-2666 module costs £94, rising up to £920 for the 64GB DDR4-3000 kit (4x16GB). Or without the RGB lights £77 ( @ Amazon) for what appears to be exactly the same memory. Honestly seems a bit desperate from Crucial. They are trying to cash in on the RGB craze because they clearly have hit a performance wall with their memory and are continuing to fall behind the competition like that have done for the last few years. Well, at least it's obvious where the “old, cenile and grumpy” corner of the internet is. Only a noob would be paying decent money for an RGB 2666MHZ and 3000MHZ set. Yes,2666MHZ which is not even that quick by modern DDR4 standards. This was the kind of stuff which cost under £70 for 16GB of 3000MHZ DDR4 in 2016. This is just Crucial palming off cheapo RAM to clueless people,who would rather have subpar performance in their computer. I could even understand if it was higher end stuff blinged out since it fits with the territory. Also look at the timings - they are terrible even at 2666MHZ. 16-18-18?? Only a person who knows nothing about computers would be buying this. This is sub-par stuff being tarted up to fool people who are not computer savvy out of their hard earned cash. £94 for a single 8GB 2666MHZ DIMM?? It also,has 15-17-17 timings too. That is a G.Skill Trident Z RGB 16GB RGB 3200MHZ kit with 16-18-18 timings for £201. Two of the Ballistix Tactical Tracer RGB DDR4 8GB DIMMs running at 2666MHZ,would cost you £188. So it fails on speed,timings and even RGB.